As I was making myself a spinach apple carrot ginger juice this morning for breakfast to go with some toast with hummus when I realized I’ve never posted this recipe on my blog. I’ve posted carrot apple ginger juice and kale apple carrot ginger juice but never spinach apple carrot ginger juice. So here’s a recipe for this super delicious green juice which is high in potassium, vitamin A and C and includes a variety of minerals such as folate and calcium. 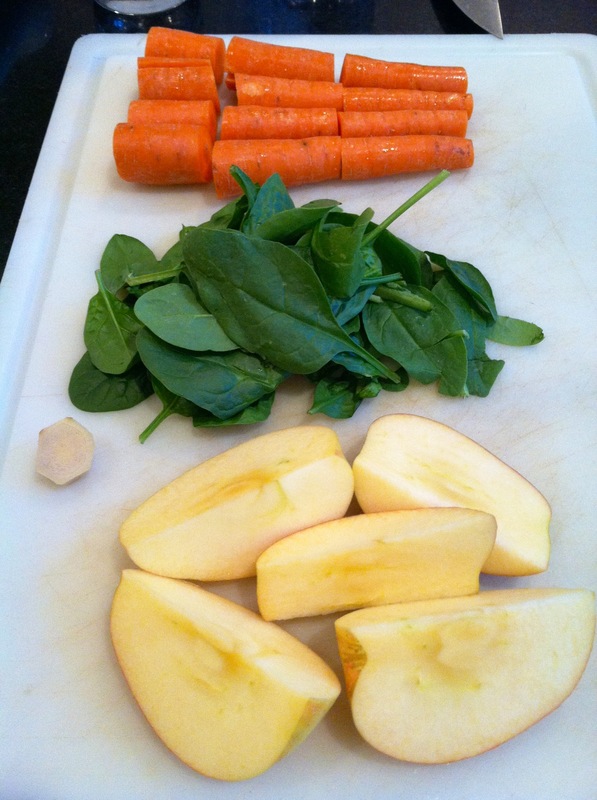 Here’s a closeup of all the ingredients I used for this spinach carrot apple ginger juice. Start by thoroughly washing your spinach, carrots and apple. Take a handful of washed spinach and set aside. Then cut your carrots and apple into small chunks. Take your ginger root and cut about a 1/4 inch thick piece. Remove the skin of the ginger root and set aside. Now all your prep work is done and it’s time to get out the good ole juicer! I put the ginger root in my juicer first followed by some carrot and apple to help push as much ginger juice through as I could possibly get out of it. Then I put in half of the handful of spinach and followed that with some carrot and apple chunks to help push that spinach through. I repeated that again with the leftover spinach and put in the remaining carrots and apple pieces. After your juicer processes all of that, you’ll be left with this delicious, nutritious juice! 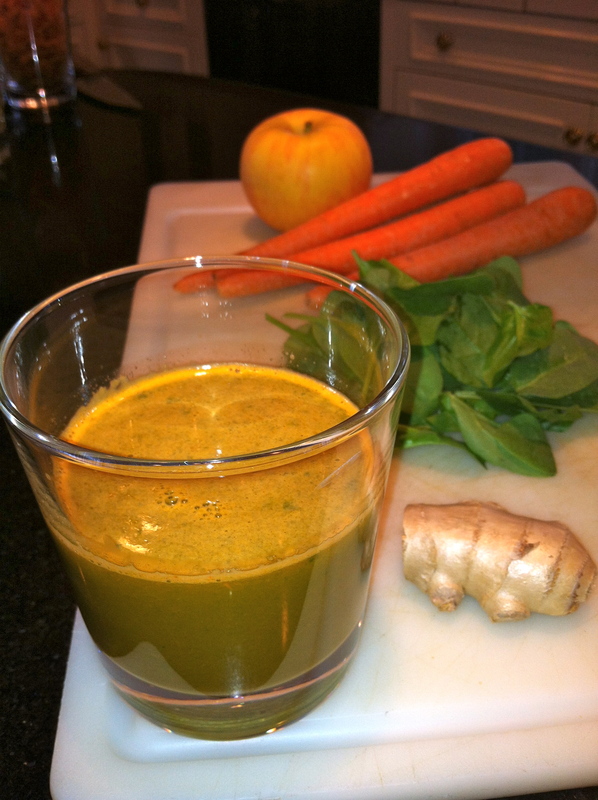 This spinach carrot apple ginger juice will give you 215 calories and 51 grams of carbohydrates. It will also give you over 1,000 milligrams of potassium and almost 5 grams of protein. In terms of vitamins, this juice will give you 14% of your daily vitamin E, 29% of your daily vitamin B-6, 69% of your daily vitamin C, and over 800% of your daily vitamin A. This juice will also give you lots and lots of minerals. Some of those include: 16% of your daily calcium, 22% of your daily magnesium, 43% of your daily folate, and 50% of your daily manganese. Great juice. I used chard instead of spinach as I have a ripe crop in te veggie garden at the moment. This made more than one glass. So glad you liked it! I bet it was quite delicious with chard as well. It’s a pretty versatile juice. You could even replace the spinach with kale if you wanted too.